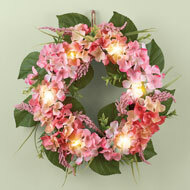 Pink and cream hydrangeas and lush greenery cover this gorgeous wreath in style, while 6 LED lights add a touch of sparkle. The batterypowered wreath can hang on your front door to welcome guests or on any wall inside your home to add seasonal style. Req. 3 "AAA" batteries (sold separately). Plastic, metal, burlap and rattan. 16"Dia. 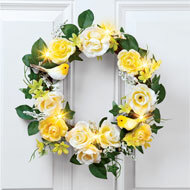 Instantly add a bright touch of Springtime color to your front door, foyer or anywhere in your home. 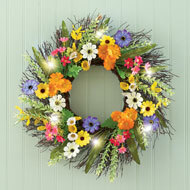 This cheerful wreath features dimensional metal daisies and a green welcome banner in the center. Hooks on the back make hanging easy. Metal. 17 1/2"L x 16"H.
Blooming coralcolored roses, Dahlias, berries and greenery cover this gorgeous wreath in style, while the 6 sparkling lights add a warm glow. Batterypowered wreath can hang on your front door to welcome guests or on any wall inside your home for a splash of color. Req. 3 "AAA" batteries (sold separately). Plastic, polyester and rattan. 17"Dia. The perfect accent anywhere in your home, this festive wreath features fall colored hydrangea blossoms, mums and roses surrounded by lush greenery. 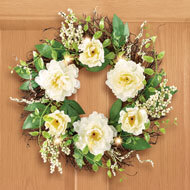 Lovely on your front door to welcome guests or in any room in your home. Hook on back for easy hanging. Polyester, plastic and rattan. 16"Dia. Multicolor daisies in pink, purple, yellow, orange and white cover this gorgeous twig wreath, while LED lights add a warm glow. This batterypowered wreath can hang on your front door to welcome guests or on any wall inside your home to add some seasonal style. Req. 3 "AAA" batteries (sold separately). Plastic, vine and polyester. 18"Dia. Blooming pink peonies, white hydrangeas, pink daisies and bright butterflies cover this gorgeous wreath in style, while 6 warm white lights add a sparkling glow. The batterypowered wreath can hang on your front door to welcome guests or on any wall inside your home to add seasonal style. Hook on the back for easy hanging. Req. 3 "AAA" batteries (sold separately). Polyester and rattan. 18"Dia. 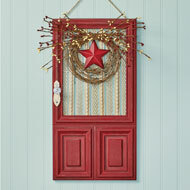 A welcome addition to your country home, this lovely wall hanging features a rustic red door with a primitive style wreath accented with a red star and berries, a crystal door handle and dimensional details. A rope at the top makes hanging easy. Iron, acrylic, wood and rattan. 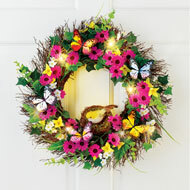 10"L x 2"W x 19 3/4"H.
Brightly colored flowers, beautiful butterflies and a charming songbird in the center give this wreath seasonal style, while six lights add some sparkle and shine. The batterypowered wreath can hang on your door to welcome guests or on any wall inside your home to add a lovely splash of color. Req. 3 "AAA" batteries (sold separately). Polyester and rattan. 18"Dia. 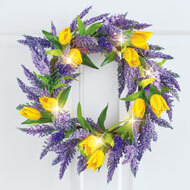 Yellow tulips and lavender cover this wreath in style, while the 6LED lights add a warm glow. The batterypowered wreath can hang on your front door to welcome guests or on any wall inside your home to add seasonal style. Req. 3 "AAA" batteries (sold separately). Plastic, rattan, and polyester. 16"Dia. 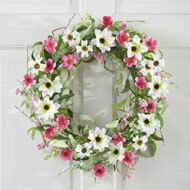 Beautiful springtime wreath features lovely pink and white blooms along with lush greenery. Hang it on your front door to welcome guests or elsewhere in the house for a fresh splash of color. Hook on back for hanging. Polyester and plastic. 22"Dia. 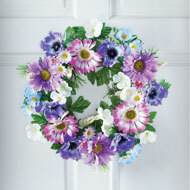 Cheerful daisies in shades of purple, pink and white, purple poppies and blue wildflowers cover this wreath in style. 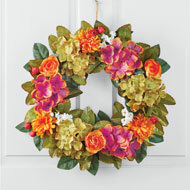 Hang it on your front door to welcome guests or on any wall inside your home to add seasonal color and style. Hook on back for easy hanging. Plastic and polyester. 18"Dia. 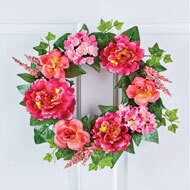 Pink peonies, roses, hydrangeas, berries and lush greenery cover this gorgeous wreath in bright, colorful beauty. The wreath can hang on your front door to welcome guests or on any wall inside your home for a splash of seasonal color. Polyester, plastic and rattan. 16"Dia. 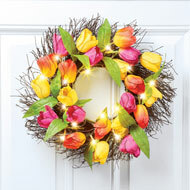 Beautiful tulips make this wreath a great way to welcome the season. 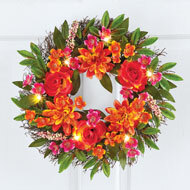 It features 15 warm LED lights plus pink, orange and yellow tulips atop a twig wreath. Lovely on your front door or anywhere inside your home, a hook on back makes hanging easy. Req. 3 "AA" batteries (sold separately).Plastic and rattan. 18"Dia. 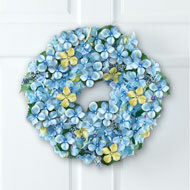 Beautiful blue hydrangeas, blue berries and lush greenery cover this gorgeous wreath in style. Hang it on your front door to welcome guests or on any wall inside your home to add colorful style. Hook on back for easy hanging. Plastic and polyester. 17"Dia. 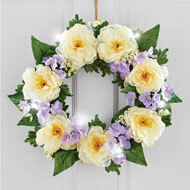 Blooming roses in yellow and cream cover this gorgeous wreath, while 6 LED lights add a warm glow. A pair of charming birds are the perfect finishing touch. This batterypowered wreath can hang on your front door to welcome guests or anywhere inside your home to add seasonal style. Hanging hardware on back. Req. 3 "AAA" batteries (sold separately). Plastic, polyester and rattan. 16"Dia. 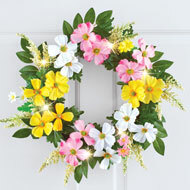 The perfect accent for your Springtime home, this festive wreath features colorful pink, yellow and white dogwood flowers surrounded by lush greenery. 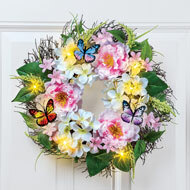 Perfect on your front door to welcome guests or anyone inside your home, it has 6 LED lights that add a touch of sparkle. Hook on back for easy hanging. Req. 3 "AAA" batteries (sold separately). Polyester, plastic, and rattan. 16"Dia. 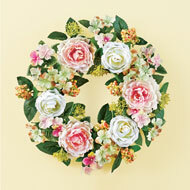 Blooming roses, lush peonies, colorful hydrangeas, berries and greenery cover this gorgeous wreath in classic style. The lovely wreath is perfect on your front door to welcome guests or anywhere inside your home to add some seasonal style. Hook for easy hanging. Polyester and plastic. 18"Dia. Blooming white peonies accented with purple flowers and greenery cover this gorgeous wreath in style, while white 6 LED lights add a sparkling glow. The batterypowered wreath can hang on your front door to welcome guests or on any wall inside your home to add some seasonal style. Rope hook on top for easy hanging. Req. 3 "AAA" batteries (sold separately). Polyester and vine. 16"Dia. x 4"W.
Beautifully blooming white peonies, white berries and greenery cover this gorgeous wreath in style, while 6 sparkling white lights add some shimmer and shine. The batterypowered wreath can hang on your front door to welcome guests or on any wall inside your home to add an instant splash of seasonal style. Hook on the back for easy hanging. Req. 3 "AAA" batteries (sold separately). Polyester, polyfoam, plastic and rattan. 18"Dia.